The Vision of John on Patmos by Julius Schnorr von Carolsfeld 1860. The author names himself in the text as "John", but his precise identity remains a point of academic debate. Second-century Christian writers such as Justin Martyr, Irenaeus, Melito the bishop of Sardis, and Clement of Alexandria and the author of the Muratorian fragment identify John the Apostle as the "John" of Revelation. Modern scholarship generally takes a different view, and many consider that nothing can be known about the author except that he was a Christian prophet. [citation not found] Some modern scholars characterise Revelation's author as a putative figure whom they call "John of Patmos". The bulk of traditional sources date the book to the reign of the Roman emperor Domitian (AD 81–96), and the evidence tends to confirm this. The book spans three literary genres: the epistolary, the apocalyptic, and the prophetic. It begins with John, on the island of Patmos in the Aegean Sea, addressing a letter to the "Seven Churches of Asia". He then describes a series of prophetic visions, including figures such as the Seven Headed Dragon, The Serpent and the Beast, culminating in the Second Coming of Jesus. The name Revelation comes from the first word of the book in Koine Greek: ἀποκάλυψις (apokalypsis), which means "unveiling" or "revelation". The author names himself as "John", but modern scholars consider it unlikely that the author of Revelation also wrote the Gospel of John. Pope Dionysius of Alexandria set out some of the evidence for this view as early as the second half of the third century, noting that the gospel and the epistles attributed to John, unlike Revelation, do not name their author, and that the Greek of the gospel is stylistically correct and elegant while that of Revelation is neither; some later scholars believe that the two books also have radical differences in theological perspective. Tradition ascribes the authorship to John the Apostle, but it seems unlikely that the apostle could have lived into the most likely time for the book's composition, the reign of Domitian, and the author never states that he knew Jesus. All that is known is that this John was a Jewish Christian prophet, probably belonging to a group of such prophets, and was accepted as such by the congregations to whom he addresses his letter. [citation not found] His precise identity remains unknown, and modern scholarship commonly refers to him as "John of Patmos"  (Rev. 1:9 – "I was put on the Island of Patmos"). Revelation is an apocalyptic prophecy with an epistolary introduction addressed to seven churches in the Roman province of Asia. 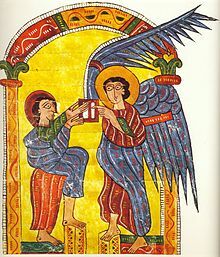 "Apocalypse" means the revealing of divine mysteries; John is to write down what is revealed (what he sees in his vision) and send it to the seven churches. The entire book constitutes the letter—the letters to the seven individual churches are introductions to the rest of the book, which is addressed to all seven. While the dominant genre is apocalyptic, the author sees himself as a Christian prophet: Revelation uses the word in various forms twenty-one times, more than any other New Testament book. According to several studies including a review by Dr James Tabor and Dr J. Massyngberde Ford, the Book of Revelation contains ancient pre-Christian texts of Jewish origin dating back to the time of John the Baptist and the communities of Qumran as well as antique Jewish texts. In several verses one can identify the ancient texts and that attributed to John, the latter having just added in the original text the words "Jesus Christ" (Rev 1: 1), "testimony of Jesus Christ" (Rev. 1: 2) or even "Jesus" (Rev 1: 9), and similar words in dozens of other verses. Conventional understanding until recent times was that the Book of Revelation was written to comfort beleaguered Christians as they underwent persecution at the hands of a megalomaniacal Roman emperor, but much of this has now been jettisoned: Domitian is no longer viewed as a despot imposing an imperial cult, and it is no longer believed that there was any systematic empire-wide persecution of Christians in his time. [additional citation(s) needed] The current view is that Revelation was composed in the context of a conflict within the Christian community of Asia Minor over whether to engage with, or withdraw from, the far larger non-Christian community: Revelation chastises those Christians who wanted to reach an accommodation with the Roman cult of empire. This is not to say that Christians in Roman Asia were not suffering, for withdrawal from, and defiance against, the wider Roman society, which imposed very real penalties; Revelation offered a victory over this reality by offering an apocalyptic hope: in the words of professor Adela Yarbro Collins, "What ought to be was experienced as a present reality." Revelation was the last book accepted into the Christian biblical canon, and to the present day some churches that derive from the Church of the East reject it. Eastern Christians became skeptical of the book as doubts concerning its authorship and unusual style were reinforced by aversion to its acceptance by Montanists and other groups considered to be heretical. This distrust of the Book of Revelation persisted in the East through the 15th century. Dionysius (248 AD), bishop of Alexandria, disciple of Origen wrote that the Book of Revelation could have been written by Cerinthus although he himself did not adopt the view that Cerinthus was the writer. He regarded the Apocalypse as the work of an inspired man but not of an Apostle (Eusebius, Church History VII.25). 1. ... it is proper to sum up the writings of the New Testament which have been already mentioned... After them is to be placed, if it really seem proper, the Apocalypse of John, concerning which we shall give the different opinions at the proper time. These then belong among the accepted writings [Homologoumena]. 4. Among the rejected [Kirsopp. Lake translation: "not genuine"] writings must be reckoned, as I said, the Apocalypse of John, if it seem proper, which some, as I said, reject, but which others class with the accepted books. 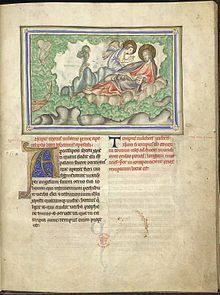 The Apocalypse of John, also called Revelation, is counted as both accepted (Kirsopp. Lake translation: "Recognized") and disputed, which has caused some confusion over what exactly Eusebius meant by doing so. The disputation can perhaps be attributed to Origen. Origen seems to have accepted it in his writings. Cyril of Jerusalem (348 AD) does not name it among the canonical books (Catechesis IV.33–36). Athanasius (367 AD) in his Letter 39,Augustine of Hippo (c. 397 AD) in his book On Christian Doctrine (Book II, Chapter 8), Tyrannius Rufinus (c. 400 AD) in his Commentary on the Apostles' Creed, Pope Innocent I (405 AD) in a letter to the bishop of Toulouse and John of Damascus (about 730 AD) in his work An Exposition of the Orthodox Faith (Book IV:7) listed "the Revelation of John the Evangelist" as a canonical book. The Council of Laodicea (363) omits it as a canonical book. The Decretum Gelasianum, which is a work written by an anonymous scholar between 519 and 553, contains a list of books of scripture presented as having been reckoned as canonical by the Council of Rome (382 AD). This list mentions it as a part of the New Testament canon. The Synod of Hippo (in 393), followed by the Council of Carthage (397), the Council of Carthage (419), the Council of Florence (1442 AD) and the Council of Trent (1546 AD) classified it as a canonical book. The Apostolic Canons, approved by the Eastern Orthodox Council in Trullo in 692, but rejected by Pope Sergius I, omit it. Doubts resurfaced during the Protestant Reformation. Martin Luther called it "neither apostolic nor prophetic" in the 1522 preface to his translation of the New Testament (he revised his position with a much more favorable assessment in 1530), and it was the only New Testament book on which John Calvin did not write a commentary. As of 2015[update] it remains the only New Testament work not read in the Divine Liturgy of the Eastern Orthodox Church, though Catholic and Protestant liturgies include it. 47 (3rd century); the minuscules (8th to 10th century), plus fragmentary quotations in the Church fathers of the 2nd to 5th centuries and the 6th-century Greek commentary on Revelation by Andreas. Divisions in the book seem to be marked by the repetition of key phrases, by the arrangement of subject matter into blocks, and associated with its Christological passages, and much use is made of significant numbers, especially the number seven, which represented perfection according to ancient numerology. Nevertheless, there is a "complete lack of consensus" among scholars about the structure of Revelation. The following is therefore an outline of the book's contents rather than of its structure. Admonished not to fear the "synagogue of Satan", nor fear a ten-day tribulation of being thrown into prison. Praised for holding "fast to My name", not denying "My faith" even in the days of Antipas, "My faithful martyr." Praised for having some strength, keeping "My word", and having not denied "My name." Reminded to hold fast what they have, that no one may take their crown. Admonished to be zealous and repent from being "lukewarm"; they are instructed to buy the "gold refined in the fire", that they may be rich; to buy "white garments", that they may be clothed, so that the shame of their nakedness would not be revealed; to anoint their eyes with eye salve, that they may see. 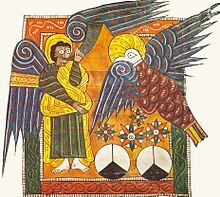 An eighth angel takes a "golden censer", filled with fire from the heavenly altar, and throws it to the earth (8:3–5). What follows are "peals of thunder, rumblings, flashes of lightning, and an earthquake" (8:5). Aftermath: Vision of John given by "an angel who had the seven bowls"
Revelation has a wide variety of interpretations, ranging from the simple historical interpretation, to a prophetic view on what will happen in the future by way of the Will of God and the Woman's victory on Satan ("symbolic interpretation"), to different end time scenarios ("futurist interpretation"), to the views of criticists who deny any spiritual value to Revelation at all, ascribing it to a human-inherited archetype. This interpretation, which has found expression among both Catholic and Protestant theologians, considers the liturgical worship, particularly the Easter rites, of early Christianity as background and context for understanding the Book of Revelation's structure and significance. This perspective is explained in The Paschal Liturgy and the Apocalypse (new edition, 2004) by Massey H. Shepherd, an Episcopal scholar, and in Scott Hahn's The Lamb's Supper: The Mass as Heaven on Earth (1999), in which he states that Revelation in form is structured after creation, fall, judgment and redemption. Those who hold this view say that the Temple's destruction (AD 70) had a profound effect on the Jewish people, not only in Jerusalem but among the Greek-speaking Jews of the Mediterranean. 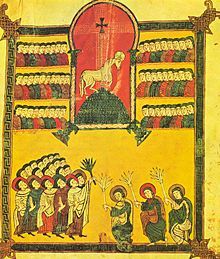 They believe the Book of Revelation provides insight into the early Eucharist, saying that it is the new Temple worship in the New Heaven and Earth. The idea of the Eucharist as a foretaste of the heavenly banquet is also explored by British Methodist Geoffrey Wainwright in his book Eucharist and Eschatology (Oxford University Press, 1980). According to Pope Benedict XVI some of the images of Revelation should be understood in the context of the dramatic suffering and persecution of the churches of Asia in the 1st century. 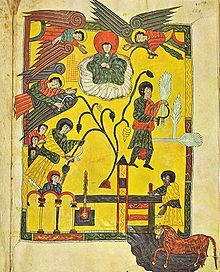 In the Coptic Orthodox Church the whole Book of Revelation is read during Apocalypse Night or Good Friday. Idealism/Allegoricalism, which holds that Revelation does not refer to actual people or events, but is an allegory of the spiritual path and the ongoing struggle between good and evil. 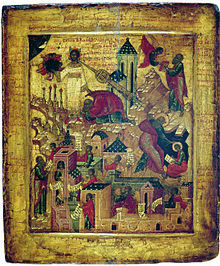 An Orthodox icon of the Apocalypse of St. John, 16th century. 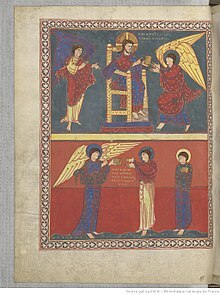 Book of Revelation is the only book of the New Testament that is not read during services by the Byzantine Rite Churches although in the Western Rite Orthodox Parishes, which are under the same bishops as the Byzantine Rite, it is read. The early Protestants followed a historicist interpretation of the Bible, which identified the Pope as the Antichrist. Similar to the early Protestants, Adventists maintain a historicist interpretation of the Bible's predictions of the apocalypse. Seventh-day Adventists believe the Book of Revelation is especially relevant to believers in the days preceding the second coming of Jesus Christ. "The universal church is composed of all who truly believe in Christ, but in the last days, a time of widespread apostasy, a remnant has been called out to keep the commandments of God and the faith of Jesus." "Here is the patience of the saints; here are those who keep the commandments of God and the faith of Jesus." As participatory agents in the work of salvation for all humankind, "This remnant announces the arrival of the judgment hour, proclaims salvation through Christ, and heralds the approach of His second advent." The three angels of Revelation 14 represent the people who accept the light of God's messages and go forth as His agents to sound the warning throughout the length and breadth of the earth. By the analogous reasoning between the Millerite historicism, and Baha'u'llah's doctrine of progressive revelation, a modified historicist method of interpreting prophecy have become integrated in foremost American Bahá'í teachings. `Abdu'l-Bahá has given some interpretations about the 11th and 12th chapters of Revelation in Some Answered Questions. The 1,260 days spoken of in the forms: one thousand two hundred and sixty days, forty-two months, refers to the 1,260 years in the Islamic Calendar (AH 1260 or 1844 CE). The "two witnesses" spoken of are Muhammad and Ali. Also, the Bible reads, "And there appeared a great wonder in heaven; and behold a great red dragon, having seven heads and ten horns, and seven crowns upon his heads". The seven heads of the dragon are symbolic of the seven provinces dominated by the Umayyads: Damascus, Persia, Arabia, Egypt, Africa, Andalusia, and Transoxania. 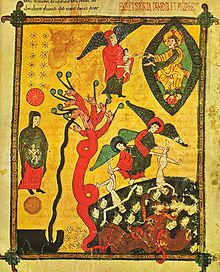 The ten horns represent the ten names of the leaders of the Umayyad dynasty: Abu Sufyan, Muawiya, Yazid, Marwan, Abd al-Malik, Walid, Sulayman, Umar, Hisham, and Ibrahim. Some names were re-used, as in the case of Yazid II and Yazid III and the like, which were not counted for this interpretation. Doctrine and Covenants, section 77, postulates answers to specific questions regarding the symbolism contained in the Book of Revelation. [non-primary source needed] Topics include: the sea of glass, the four beasts and their appearance, the 24 elders, the book with seven seals, certain angels, the sealing of the 144,000, the little book eaten by John, and the two witnesses in Chapter 11. Members of The Church of Jesus Christ of Latter-day Saints believe that the warning contained in Revelation 22:18–19 does not refer to the biblical canon as a whole. Rather, an open and ongoing dialogue between God and the modern-day Prophet and Apostles of the LDS faith constitute an open canon of scripture. The radical discipleship interpretation asserts that the Book of Revelation is best understood as a handbook for radical discipleship; i. e., how to remain faithful to the spirit and teachings of Jesus and avoid simply assimilating to surrounding society. In this interpretation the primary agenda of the book is to expose as impostors the worldly powers that seek to oppose the ways of God and God's Kingdom. The chief temptation for Christians in the 1st century, and today, is to fail to hold fast to the non-violent teachings and example of Jesus and instead be lured into unquestioning adoption and assimilation of worldly, national or cultural values – imperialism, nationalism, and civil religion being the most dangerous and insidious. This perspective (closely related to liberation theology) draws on the approach of Bible scholars such as Ched Myers, William Stringfellow, Richard Horsley, Daniel Berrigan, Wes Howard-Brook, and Joerg Rieger. Various Christian anarchists, such as Jacques Ellul, have identified the State and political power as the Beast and the events described, being their doings and results, the aforementioned ‘wrath’. Charles Cutler Torrey taught Semitic languages at Yale University. His lasting contribution has been to show how much more meaningful prophets, such as the scribe of Revelation, are when treated as poets first and foremost. He thought this was a point often lost sight of because most English bibles render everything in prose. Poetry was also the reason John never directly quoted the older prophets. Had he done so, he would have had to use their (Hebrew) poetry whereas he wanted to write his own. Torrey insisted Revelation had originally been written in Aramaic. This was why the surviving Greek translation was written in such a strange idiom. It was a literal translation that had to comply with the warning at Revelation 22:18 that the text must not be corrupted in any way. According to Torrey, the story is that "The Fourth Gospel was brought to Ephesus by a Christian fugitive from Palestine soon after the middle of the first century. It was written in Aramaic." Later, the Ephesians claimed this fugitive had actually been the beloved disciple himself. Subsequently, this John was banished by Nero and died on Patmos after writing Revelation. Torrey argued that until AD 80, when Christians were expelled from the synagogues, the Christian message was always first heard in the synagogue and, for cultural reasons, the evangelist would have spoken in Aramaic, else "he would have had no hearing." 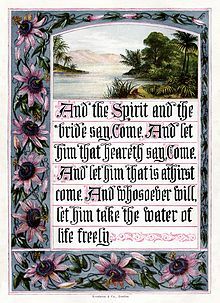 Torrey showed how the three major songs in Revelation (the new song, the song of Moses and the Lamb and the chorus at 19: 6–8) each fall naturally into four regular metrical lines plus a coda. Other dramatic moments in Revelation, such as 6:16 where the terrified people cry out to be hidden, behave in a similar way. Recently, aesthetic and literary modes of interpretation have developed, which focus on Revelation as a work of art and imagination, viewing the imagery as symbolic depictions of timeless truths and the victory of good over evil. Elisabeth Schüssler Fiorenza wrote Revelation: Vision of a Just World from the viewpoint of rhetoric. 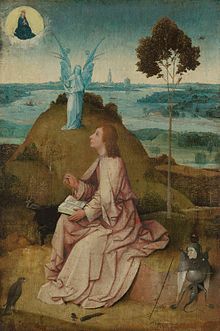 Accordingly, Revelation's meaning is partially determined by the way John goes about saying things, partially by the context in which readers receive the message and partially by its appeal to something beyond logic. Professor Schüssler Fiorenza believes that Revelation has particular relevance today as a liberating message to disadvantaged groups. John's book is a vision of a just world, not a vengeful threat of world-destruction. Her view that Revelation's message is not gender-based has caused dissent. She says we are to look behind the symbols rather than make a fetish out of them. In contrast, Tina Pippin states that John writes "horror literature" and "the misogyny which underlies the narrative is extreme." D. H. Lawrence took an opposing, pessimistic view of Revelation in the final book he wrote, Apocalypse. He saw the language which Revelation used as being bleak and destructive; a 'death-product'. Instead, he wanted to champion a public-spirited individualism (which he identified with the historical Jesus supplemented by an ill-defined cosmic consciousness) against its two natural enemies. One of these he called "the sovereignty of the intellect" which he saw in a technology-based totalitarian society. The other enemy he styled "vulgarity" and that was what he found in Revelation. "It is very nice if you are poor and not humble ... to bring your enemies down to utter destruction, while you yourself rise up to grandeur. And nowhere does this happen so splendiferously than in Revelation." His specific aesthetic objections to Revelation were that its imagery was unnatural and that phrases like "the wrath of the Lamb" were "ridiculous." He saw Revelation as comprising two discordant halves. In the first, there was a scheme of cosmic renewal in "great Chaldean sky-spaces", which he quite liked. After that, Lawrence thought, the book became preoccupied with the birth of the baby messiah and "flamboyant hate and simple lust ... for the end of the world." Lawrence coined the term "Patmossers" to describe those Christians who could only be happy in paradise if they knew their enemies were suffering in hell. Modern biblical scholarship attempts to understand Revelation in its 1st-century historical context within the genre of Jewish and Christian apocalyptic literature. This approach considers the text as an address to seven historical communities in Asia Minor. Under this interpretation, assertions that "the time is near" are to be taken literally by those communities. Consequently, the work is viewed as a warning to not conform to contemporary Greco-Roman society which John "unveils" as beastly, demonic, and subject to divine judgment. There is further information on these topics in the entries on higher criticism and apocalyptic literature. Although the acceptance of Revelation into the canon has from the beginning been controversial, it has been essentially similar to the career of other texts. 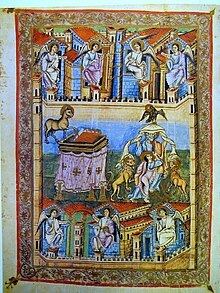 The eventual exclusion of other contemporary apocalyptic literature from the canon may throw light on the unfolding historical processes of what was officially considered orthodox, what was heterodox, and what was even heretical. Interpretation of meanings and imagery are anchored in what the historical author intended and what his contemporary audience inferred; a message to Christians not to assimilate into the Roman imperial culture was John's central message. Thus, his letter (written in the apocalyptic genre) is pastoral in nature (its purpose is offering hope to the downtrodden), and the symbolism of Revelation is to be understood entirely within its historical, literary, and social context. Critics study the conventions of apocalyptic literature and events of the 1st century to make sense of what the author may have intended. 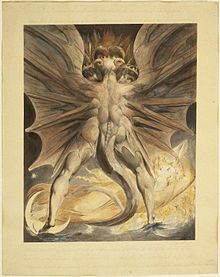 Scholar Barbara Whitlock pointed out a similarity between the consistent destruction of thirds depicted in the Book of Revelation (a third of mankind by plagues of fire, smoke, and brimstone, a third of the trees and green grass, a third of the sea creatures and a third of the ships at sea, etc.) and the Iranian mythology evil character Zahhak or Dahāg, depicted in the Avesta, the earliest religious texts of Zoroastrianism. Dahāg is mentioned as wreaking much evil in the world until at last chained up and imprisoned on the mythical Mt. Damāvand. 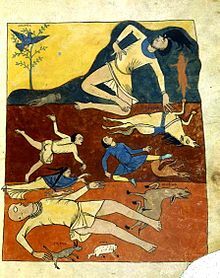 The Middle Persian sources prophesy that at the end of the world, Dahāg will at last burst his bonds and ravage the world, consuming one in three humans and livestock, until the ancient hero Kirsāsp returns to life to kill Dahāg. Whitlock wrote: "Zoroastrianism, the state religion of the Roman Empire's main rival, was part of the intellectual millieu in which Christianity came into being, just as were Judaism, the Greek-Roman religion, and the worship of Isis and Mithras. A Zoroastrian influence is completely plausible". Some commentators argue that it is these purposes – and not the structure – that really matter. G. K. Beale believes that, however much John makes use of Ezekiel, his ultimate purpose is to present Revelation as a fulfillment of Daniel 7. Richard Bauckham has argued that John presents an early view of the Trinity through his descriptions of the visions and his identifying Jesus and the Holy Spirit with YHWH. Brandon Smith has expanded on both of their proposals while proposing a "trinitarian reading" of Revelation, arguing that John uses Old Testament language and allusions from various sources to describe a multiplicity of persons in YHWH without sacrificing monotheism, which would later be codified in the trinitarian doctrine of Nicene Christianity. ^ Carson, Don (2005). An Introduction to the New Testament (2nd ed.). Grand Rapids, Michigan: Zondervan. pp. 465ff. ISBN 0-310-51940-3. ^ a b c Stuckenbruck 2003, pp. 1535–1536. ^ Perkins 2012, p. 19ff. ^ Fekkes, Jan (1994). Isaiah and Prophetic Traditions in the Book of Revelation: Visionary Antecedents and their Development (The Library of New Testament Studies). Bloomsbury T&T Clark. pp. 61–63. ISBN 185075456X. ^ Beale & McDonough 2007, pp. 1081–1084. ^ Stephens 2011, pp. 143–145. ^ Stephens 2011, p. 152. ^ Taylor, David G. K. (11 September 2002). "Christian regional diversity". In Esler, Philip F. (ed.). The Early Christian World. Routledge Worlds. Routledge (published 2002). p. 338. ISBN 9781134549191. Retrieved 28 December 2015. [...] the minor Catholic epistles and Revelation continued to be omitted, and are still not included in the canon of the church of the East which was geographically (and from the late-fifth century doctrinally) isolated in the Persian empire. ^ Stonehouse n.d., pp. 138–142. ^ of Caesarea, Eusebius. Church History, Book VII Chapter 25. newadvent. Retrieved 17 October 2016. ^ of Caesarea, Eusebius. Church History, Book III Chapter 25. newadvent. Retrieved 17 October 2016. ^ Origen. CHURCH FATHERS: Commentary on John, Book V: 3 (Origen). Retrieved 15 October 2017. ^ of Aquileia, Rufinus. Commentary on the Apostles' Creed #37. newadvent. Retrieved 12 October 2016. ^ "Letter of Innocent I on the Canon of Scripture". www.bible-researcher.com. ^ of Damascus, John. An Exposition of the Orthodox Faith, Book IV Chapter 17. newadvent. Retrieved 17 October 2016. ^ Pearse, Roger. "Tertullian : Decretum Gelasianum (English translation)". www.tertullian.org. ^ "Eccumenical Council of Florence and Council of Basel". www.ewtn.com. ^ "Paul III Council of Trent-4". www.ewtn.com. ^ "CHURCH FATHERS: Council of Carthage (A.D. 419)". www.newadvent.org. ^ Aune, David (1997). Word Biblical Commentary 52A: Revelation 1 – 5. Grand Rapids, Michigan: Zondervan. p. cxxxviii. ISBN 978-0-310-52177-8. ^ Tenney 1988, pp. 32–41. ^ Senior & Getty 1990, pp. 398–399. ^ "Introduction to the Book". pierre2.net. Archived from the original on 18 June 2018. ^ Catholic Online (23 August 2006). "Pope Benedict: Read Book of Revelation as Christ's victory over evil – International – Catholic Online". Catholic.org. Archived from the original on 5 October 2013. Retrieved 25 April 2013. ^ Averky (Taushev), Archbishop (1996). Eng. tr. Fr. Seraphim Rose (ed.). The Apocalypse: In the Teachings of Ancient Christianity. Platina, California: St. Herman of Alaska Brotherhood. ISBN 978-0-938635-67-3. ^ Holbrook, Frank (July 1983). "What prophecy means to this church". Ministry, International Journal for Pastors. 56 (7): 21. Retrieved 29 June 2017. ^ "Seventh-day Adventist 28 Fundamental Beliefs" (PDF). The Official Site of the Seventh-day Adventist World Church. General Conference of Seventh-day Adventists. Retrieved 29 June 2017. ^ "Revelation 14:12". Biblia.com. Logos Research Systems. Retrieved 29 June 2017. ^ "The Remnant and its Mission". The Official Site of the Seventh-day Adventist World Church. General Conference of Seventh-day Adventists. Retrieved 29 June 2017. ^ "Councils to the Church pg.58". Ellen G. White Writings. White Estate. Retrieved 5 October 2018. ^ "The Final Consummation: American Bahá'ís, Millerites and Biblical Time Prophecy". Retrieved 28 October 2018. ^ "Holy Bible". biblegateway.com. Retrieved 20 April 2017. ^ "Bahá'í Reference Library – Some Answered Questions, Pages 45–61". ^ a b "Doctrine and Covenants 20:35". ^ Hunter, Howard W. "No Man Shall Add to or Take Away". ^ "Articles of Faith 1:9". ^ D H Lawrence Apocalypse London: Martin Secker (1932) published posthumously with an introduction (p. v – xli) by Richard Aldington which is an integral part of the text. ^ D. H. Lawrence (1995). Apocalypse and the Writings on Revelation. Penguin Books. p. 112. ISBN 978-0-14-018781-6. ^ a b CosmoLearning. "Lecture 2: From Stories to Canon – CosmoLearning Religious Studies". ^ a b c Bart D. Ehrman (9 June 2016). "Bart Ehrman Discusses the Apocalypticist" – via YouTube. ^ Dr. Barbara Whitlock, "Tracing out the convoluted sources of Christianity" in George D. Barnes (ed. ), "Collected New Essays in Comparative Religion"
^ a b Lewis, Kim (2015). How John Wrote the Book of Revelation: From Concept to Publication. Lorton, Virginia: Kim Mark Lewis. pp. 216, 226. ISBN 1943325006. Bauckham, Richard (1993). The Theology of the Book of Revelation. Cambridge University Press. ISBN 978-0-521-35691-6. Beale, G.K.; McDonough, Sean M. (2007). "Revelation". In Beale, G. K.; Carson, D. A. (eds.). Commentary on the New Testament Use of the Old Testament. Baker Academic. ISBN 9780801026935. Burkett, Delbert (2000). An Introduction to the New Testament and the Origins of Christianity. Cambridge University Press. ISBN 9780521007207. Collins, Adela Yarbro (1984). Crisis and Catharsis: The Power of the Apocalypse. Westminster John Knox Press. ISBN 978-0-664-24521-4. Couch, Mal, ed. (2001). A Bible Handbook to Revelation. Kregel Academic. ISBN 978-0-8254-9393-5. Cross, F.L. ; Livingstone, E.A., eds. (2005). "Revelation, Book of". The Oxford Dictionary of the Christian Church (3 rev. ed.). Oxford University Press. doi:10.1093/acref/9780192802903.001.0001/acref-9780192802903-e-5853 (inactive 21 March 2018). Crutchfield, Larry V. (2001). "Revelation in the New Testament Canon". In Couch, Mal (ed.). A Bible Handbook to Revelation. Kregel Academic. ISBN 978-0-8254-9393-5. McKim, Donald K. (2014). The Westminster Dictionary of Theological Terms, Second Edition. Westminster John Knox Press. ISBN 9780664238353. Mounce, Robert H. (1998). The Book of Revelation. Eerdmans. ISBN 9780802825377. Pagels, Elaine (2012) Revelations: Visions, Prophecy, and Politics in the Book of Revelation, Viking Adult, ISBN 0-670-02334-5 Prigent P., L'Apocalypse, Paris 1981. Weor, Samael Aun (2004) . The Aquarian Message: Gnostic Kabbalah and Tarot in the Apocalypse of St. John. Thelema Press. ISBN 0-9745916-5-3. Pattemore, Stephen (2004). The People of God in the Apocalypse. Cambridge University Press. ISBN 9781441236555. Roloff J., Die Offenbarung des Johannes, Zürich 1987. Schnelle, Udo (2007). Theology of the New Testament [tr.2009]. Baker Academic. ISBN 978-0-8010-3604-0. Stuckenbruck, Loren T. (2003). "Revelation". In Dunn, James D. G.; Rogerson, John William (eds.). Eerdmans Commentary on the Bible. Eerdmans. p. 1535. ISBN 978-0-8028-3711-0. 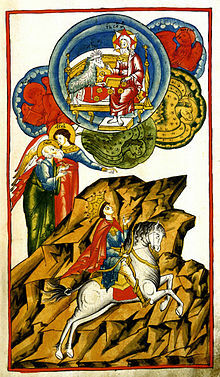 Wikimedia Commons has media related to Book of Revelation. Biesen, C. van den (1913). "Apocalypse" . Catholic Encyclopedia. Schem, A. J. (1879). "Apocalypse" . The American Cyclopædia.